Columbia River water, September 5th, 2017, morning after the Eagle Creek fire began. Jantzen Bay, Portland, Oregon. A tangerine moon shone eerily through the hazy night sky. 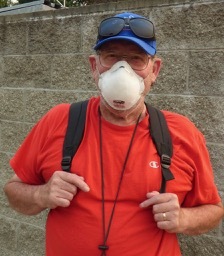 Riding my bicycle home from West Marine Monday eve I was puzzled by debris hitting my eyes. Yes, I'd heard about the Eagle Creek fire which started earlier that day, was still raging, but it was over 30 miles away. Water surface, morning after Eagle Creek fire, in an adjacent slip to ours in Jantzen Bay Marina. 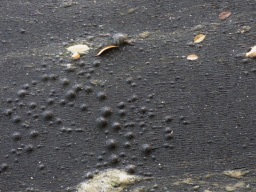 Ash on one of the other docks on Hayden Island from the Eagle Creek Fire. Then again, when Mt. St. Helens blew its volcanic top in 1980, I recall hearing one of my colleagues -- who was in Astoria, over 100 miles away from the explosion -- comment, incredulously, "The ash-filled Columbia River flowed as sluggishly as the Ganges." Mt. 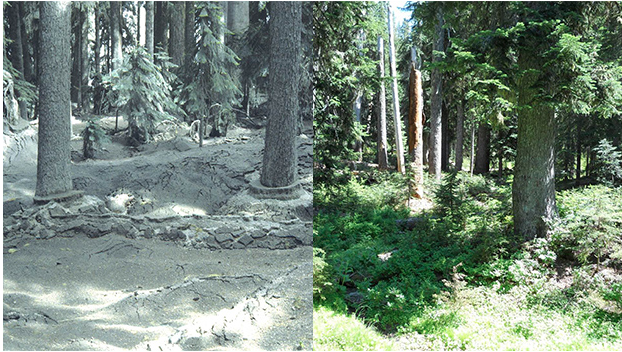 St. Helens forest area; 1980s explosion compared to the same spot in 2013. Image pilfered from this CBS news story. While Mt. St. Helen's, the United States most devastating volcanic explosion, will never be the same, visible recovery began before a year was out. Still in recovery, today the Mt. St. Helens area is teaming with life. It is different life, yet it is also thriving with biodiversity. The Columbia Gorge Natural Scenic area is an incredible treasure that drew me to relocate from California to the great Pacific Northwest. Like so many other Gorge visitors, past and present, this amazing wonder of mighty rivers, bubbling streams, soaring peaks and verdant valleys, stately forests, vigorous ferns and winsome wildflowers holds a place near and dear to my heart. Ash highlight the spiderwebs. 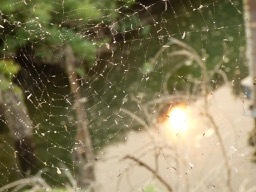 The spiders, continuing in their spidery ways, appeared undaunted by the event. While I grieve the fire and its devastation, it cannot erase my memories. 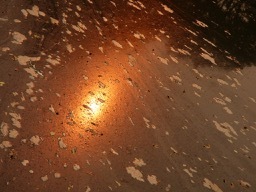 Reports this morning say the fire is at last beginning to be contained, though over 30,000 acres thus far are affected. It is bad. Surely, much of the wildlife was unable to outrun the fire. Not only are many ancient trees forever gone, we do not yet know how much of the Gorge's scenic beauty is lost. There are also many far-reaching effects, including for the first time in its 30 year history, Cycle Oregon was canceled. What a contrast so shortly after the tourist high brought on by the "Path of Totality" solar eclipse. Ashes dust the blossoms of the Jim Canton Rose Garden at our marina. Yet Lt. Damon Simmons, a spokesman for the Oregon State Fire Marshal, explained "The gorge still looks like the gorge. It's not a wasteland. It's not a blackened, destroyed no-man's land. There are trees everywhere and they look good. That's not to say there isn't damage to some of those trees," he said. "But it's still a beautiful drive through there and it still looks good." 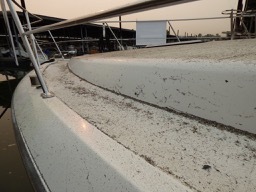 Ash on a boat in our marina. Due to our covered slip, we were spared some of the Eagle Creek Fire ash. from the fire. Others complained of headaches and stomach aches. Admittedly, I write this from a mountain retreat in Estacada, to get a brief respite from the ash and some of the smoke. Later today, I will return home. 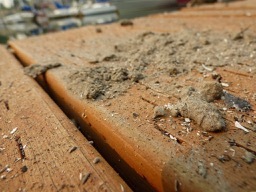 When the ash stops falling, I will do a proper clean-up. Before long, I will return to the Gorge, to those areas that allow it. The Gorge will need our loving support more than ever. More than ever, I regret not making it further up to my beloved Gorge sooner, since returning to the area. Several times we'd planned it, turning around just before Multnomah Falls. A diligent neighbor washing ash off his trawler. I will follow his suit when the ash stops falling. Consider this a reminder that change is the only constant we can count on. Do not put off seeing the natural wonders at your doorstep, and beyond. Capture those images and experiences in your hearts and with your cameras and your words. You never know what it will look like tomorrow. At the same time, I am hoping some good will come of this disaster. That controlled burns become more actively used to prevent fires like the Eagle Creek fire from reaching the proportions it has. That together we can join the efforts assisting with recovery (note: an update will be posted linking to donation-accepting organizations most effective and efficient in that regard). 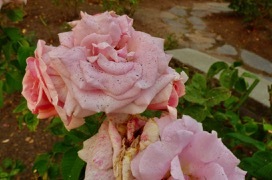 More than anything, I hope that new life will blossom, that otherwise would not have. Even this iPhone image reveals how terrible Portland's air quality's become as a result if the Eagle Creek fire. Jantzen Bay Marina. We are currently docked in Portland, Oregon (N45.47.449 W122.47.189), living aboard a new-to-us Puget Trawler we call Serendipity. While there are still many GalleyWenchTales to tell of our journeys, we're still settling into our new home. New adventures await, too. Meanwhile, sometimes the here-and-now is dramatic enough -- like the Eagle Creek Fire and Total Solar Eclipse -- those stories take precedence over our sailing sagas.